Straitline's main area of operation is in forest products, the company has demonstrated its ability to professionally and efficiently handle breakbulk and project cargoes. 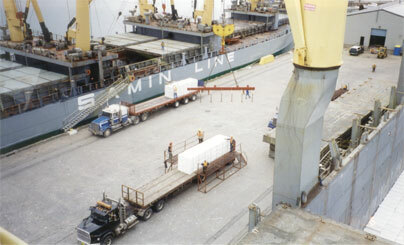 Straitline Stevedoring was established in the Port of Pictou in 1985. Straitline now works in the port of Mulgrave as well as other ports by arrangement. Over the years, Straitline has demonstrated that working closely with the customer and recognizing their needs has been the cornerstone of an efficient operation. Relying heavily on in-house training for typical material handling skills, Straitline has instilled a culture of pride in its workforce.